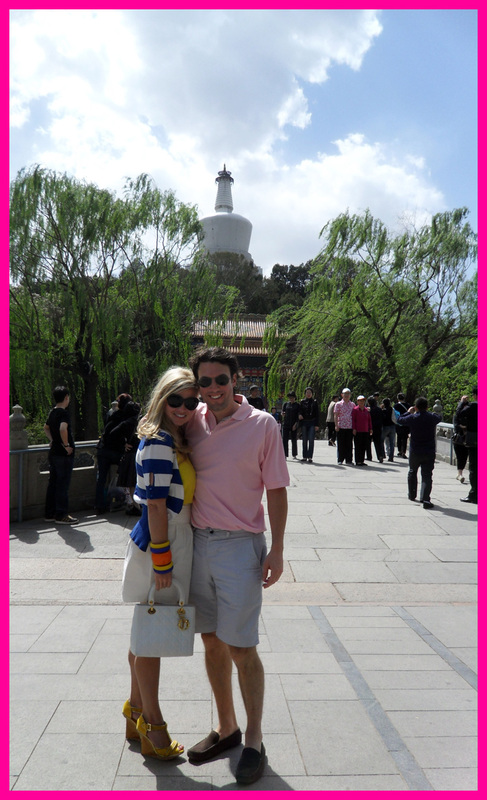 Before moving to China I had never heard of Dalian – a city due east of Beijing on a peninsula. I assume that most Americans are not familiar with Dalian either, which is funny because it has over 6 million people (over 2 times the size of Chicago – the 3rd largest city in the US). Brett and I have been spending quite a lot of time in Dalian due to his work, and I imagine there will be many more trips in the future. So – I think the best way to document the city is through photos and captions. This way I will be able to update the stories and experiences of this city by the sea often and easily. 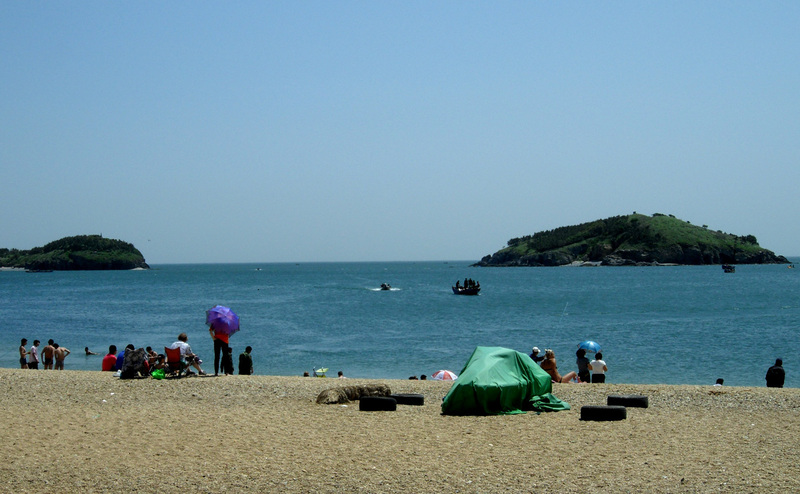 The beaches in Dalian are actually quite bare. While there is definitely no shortage of humans, luxury resorts have no presence at all. In my opinion, someone is missing out on a great opportunity here. Will someone please get on this? I would love to have a cheap beach option that is only a 1 hour flight away from Beijing! 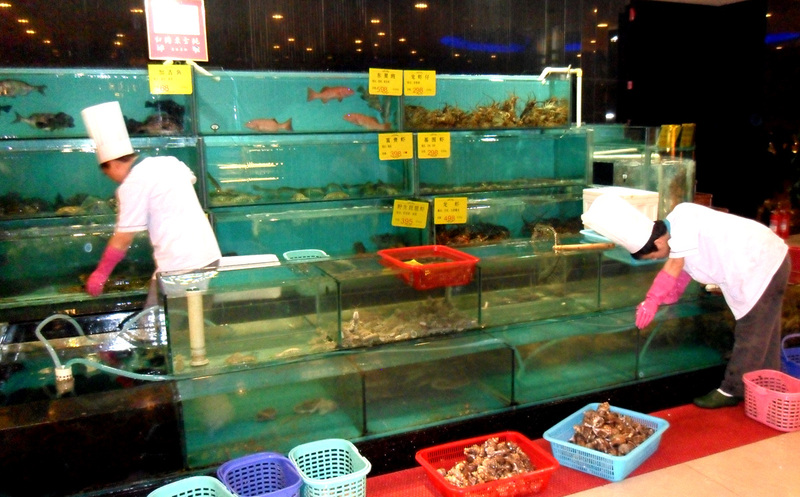 Of course most places by the sea offer tasty and fresh seafood but Dalian takes this to a new level. Almost all of the restaurants allow you to visit tanks within the dining space to select your main course while it is still living. Sometimes your dish is still living when it is served! 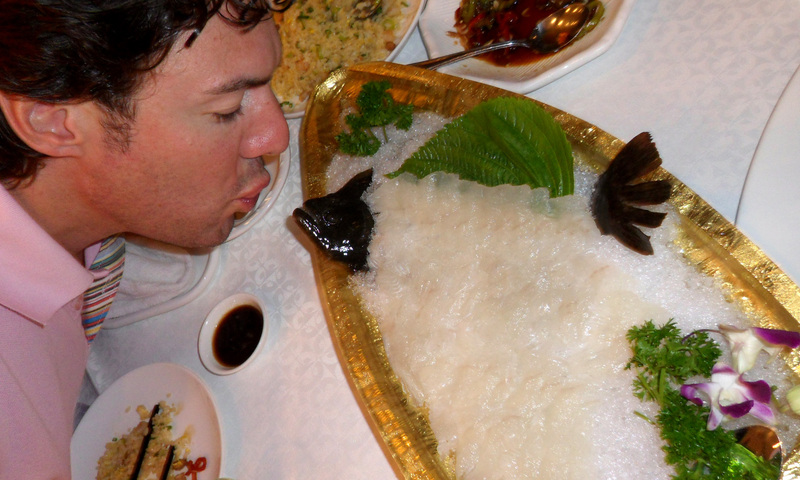 This is Brett kissing our sashimi. The fun part....it kissed him back! 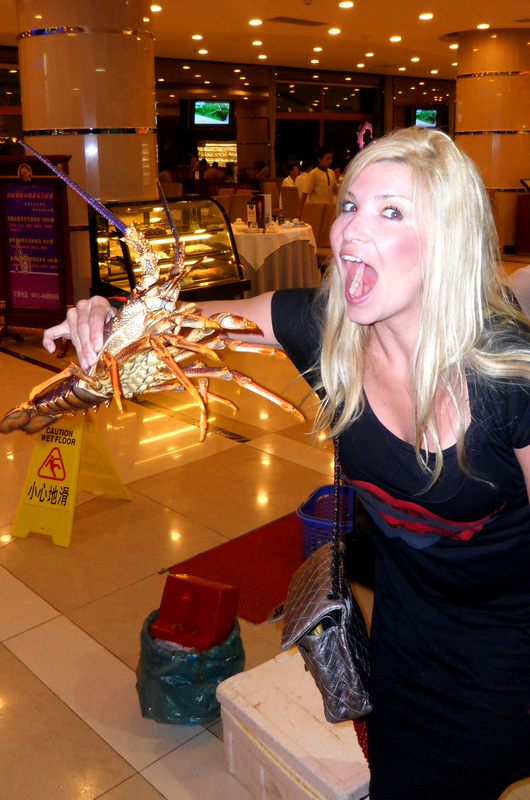 Hand picked lobster. I waited to eat him until after he was properly prepared! Back wall of restaurant - lined entirely with tanks, buckets, and baskets with everything from sea sausage (don't ask and don't eat) to king crab. We typically stay at the Kempinski Hotel during our trips to Dalian, which is right across from Labor Park. The park is sort of a hybrid between an amusement park and a pedestrian area. There are beautiful gardens with areas to relax mixed in with a handful of rollercoasters and games. 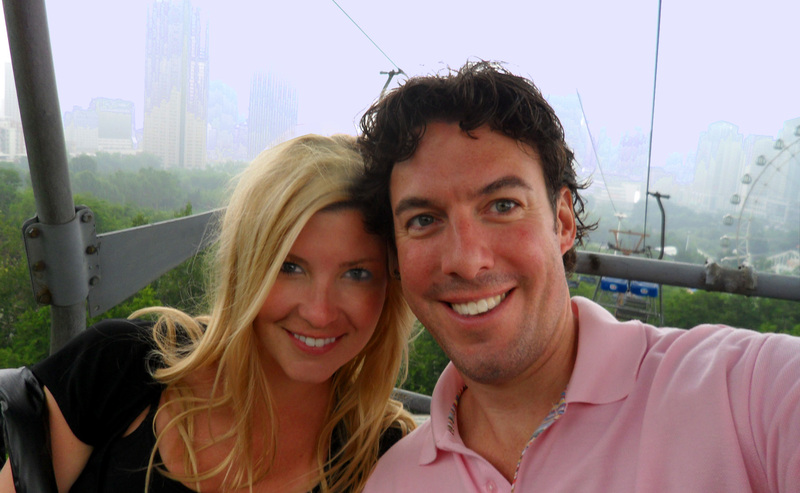 We took the gondola ride to get a better view of the city. Unfortunately it started to rain shortly after our trip began....but on a positive note - we did get a lovely view of the inside of a cloud! 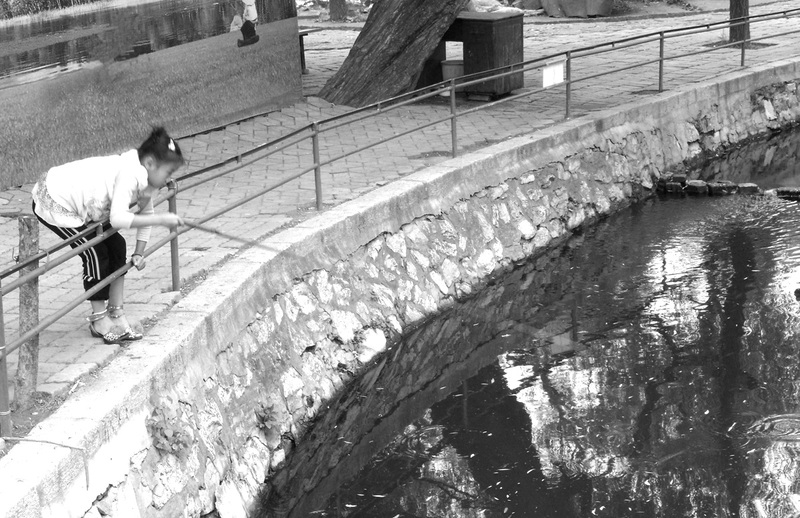 This little girl is literally fishing for gold fish. I think this explains why they are so thin. Clearly...this is going to be my new diet plan. Enjoying local ale at the Paulaner Brauhaus & Restaurant. This place has a great live band every night. And...like everywhere else in the world - they are googoo for GAGA! After what felt like the longest and coldest winter of my life, I was ecstatic when spring finally sprung. Brett and I could not get outside fast enough to soak up some Beijing rays (I believe it is actually called smog but beggars can’t be choosers, right?) 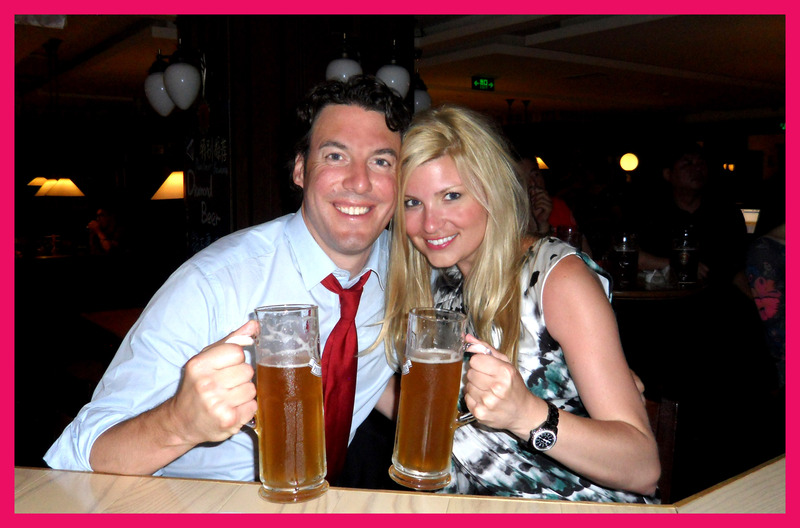 and enjoy a cold Tsingdao (local beer) at a fun rooftop bar. Many of our local and expat friends recommended a park area in the center of the city called Houhai, and we decided to give it a go. Unfortunately for my feet, the park was a “little” larger than we anticipated. Nevertheless, it was my first opportunity of the season to sport a new pair of platform sandals, and I didn’t want to miss it. Truthfully, the shoes were inappropriately high for a day at the park and even though my brain knew better…fashion overruled. My good friend, Giant Festering Blister, showed up soon after our arrival. Thankfully, Brett was a true gentleman and flagged down a rickshaw to take us around the area. We overpaid like total newbies, but sometimes it is just not worth the time to haggle over $1USD! 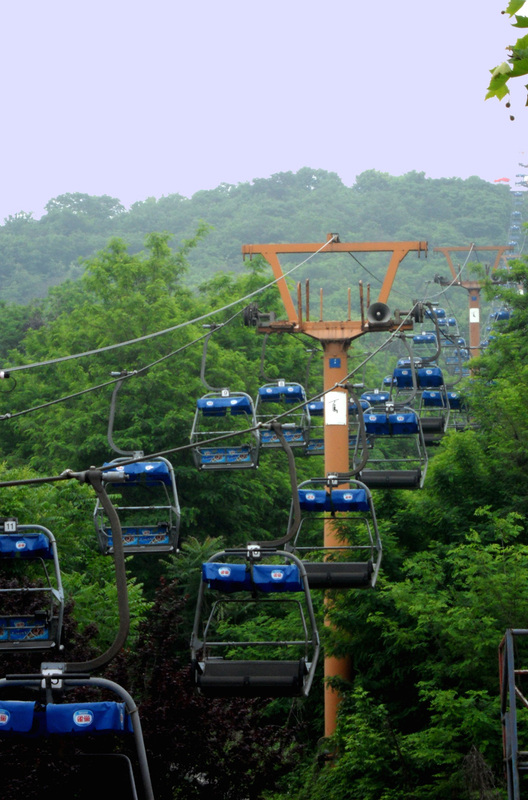 The ride around the park was actually quite charming and pleasant until the traffic jam. That’s right…a rickshaw traffic jam. 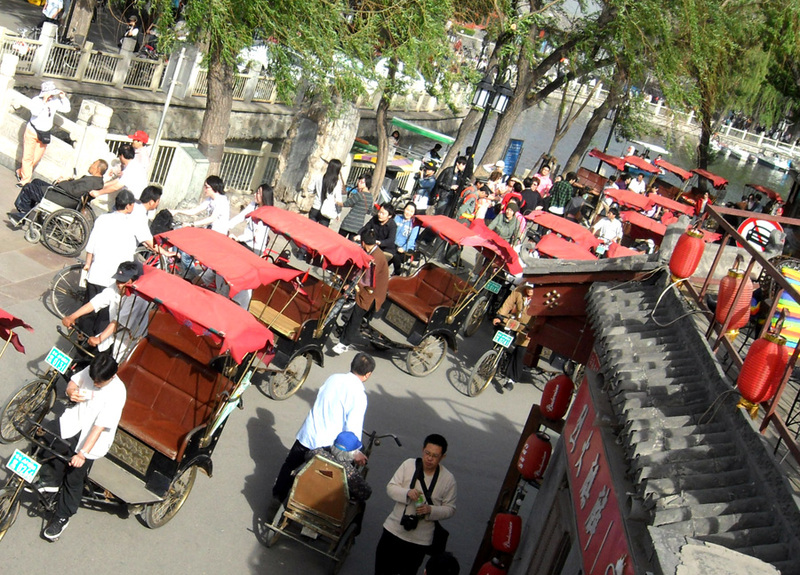 Only in China can a rickshaw traffic jam exist. Check out the crazy cluster in this photo. Other than crazy Chinese rickshaw drivers, the area is entirely lovely. Numerous cafes, bars, and boutiques surround the Houhai Lake which once served as the terminus of the old Beijing canal system. We found a quaint rooftop spot overlooking a bridge where we could watch Chinese paddle boat mania. 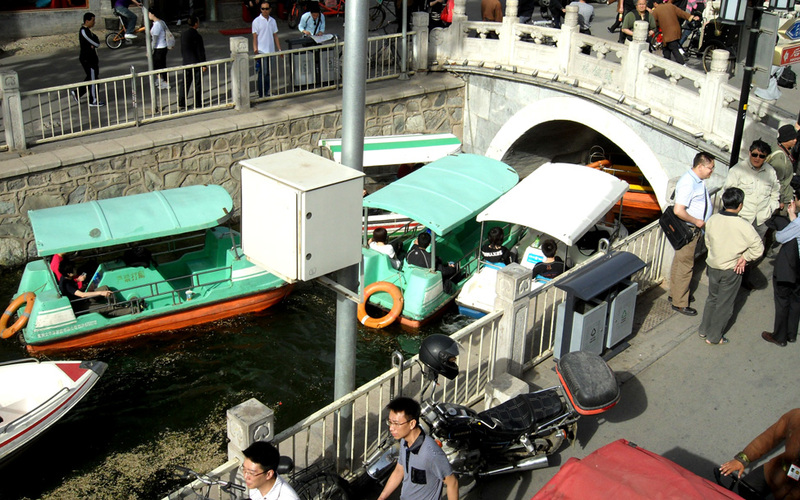 Seriously, paddle boat traffic jams? I really shouldn’t be surprised – human traffic jams exist here. I swear there is no courtesy, right of way, or any semblance of order in any form of transportation in this country. I am making a concerted effort to find this amusing rather than frustrating, but the fact is that our driver had to tell me to calm down after I shouted at an extremely rude cabbie two days ago. This clearly demonstrates my lack of progress in the matter. I should also take this opportunity to openly reveal that I am a horrendous driver. There is no judgement here – only amazement. The truth is – Houhai is a lovely spot to spend a sunny Beijing afternoon. We will definitely go back. I am not sure that we will ever have the desire to partake in the paddle boat madness, but we will definitely watch from afar with cold beverages in hand. Bravo to those forward thinkers who turned this once low-rent part of town into a buzzing hotspot.